I don’t know how to begin to thank you for helping us get through this hard time. You gave us such good advice and made our loved one look his best. Your words of encouragement and the time you took to just talk to me has meant so much to me. Thank you so much for making a difficult time much easier to handle. You went beyond your job. Your professionalism is beyond words can say! From the bottom of our hearts, thank you again, it was a pleasure dealing with you and Donohue Cecere and thanks to Tommy too!! 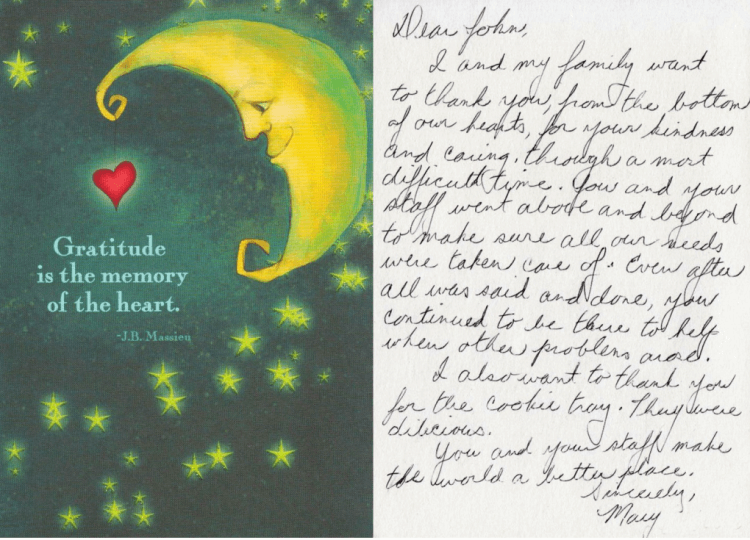 Our hearts are full of gratefulness to all of you for helping us make a lovely goodbye to Dad, Sal. From beginning to end it was easy and perfect. I am truly glad that I followed my heart and chose to have dad taken good care of with you all. 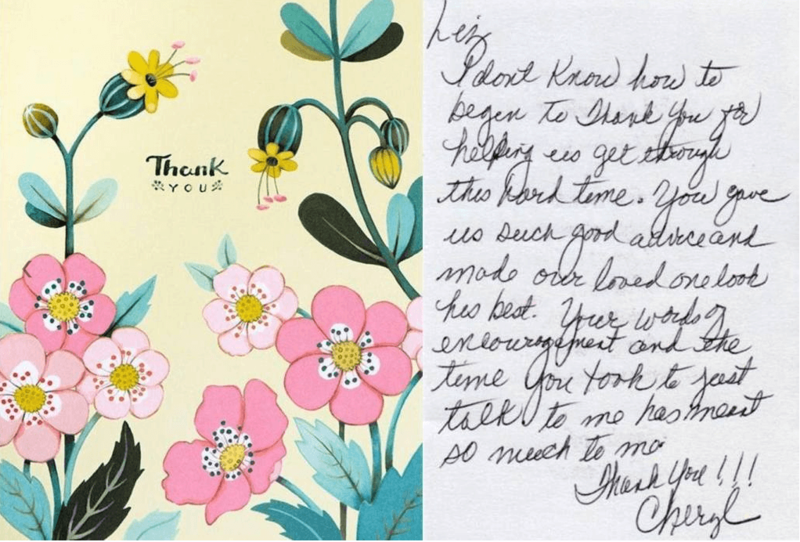 Mom and I often still speak of how wonderful you all were and are. 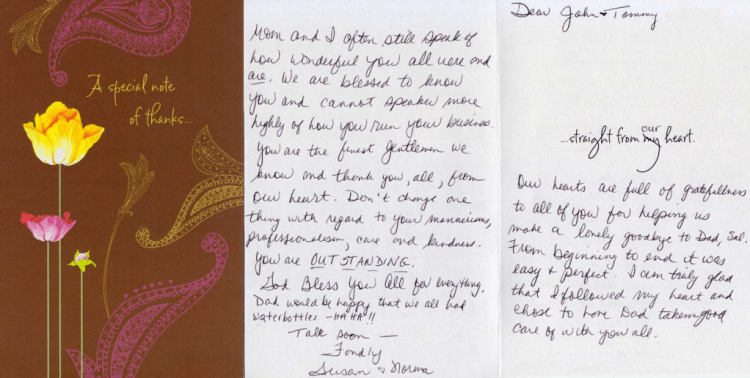 We are blessed to know you and cannot speak more highly of how you run your business. You are the finest gentlemen we know and thank you all, from our hearts. Don’t change one thing with regard to you mannerisms, professionalism, care and kindness. You are OUTSTANDING. God bless you all for everything. Dad would be happy that we all had water bottles – ha ha!! Thank you from the bottom of our hearts for making such a difficult time so much easier. You all are so amazing at your jobs and can see clearly you have followed your calling. The grace, patience and understanding (for all our needs) demonstrated by you was just outstanding. You opened our hearts and put our minds at ease so we could enjoy our final hours with our dad. 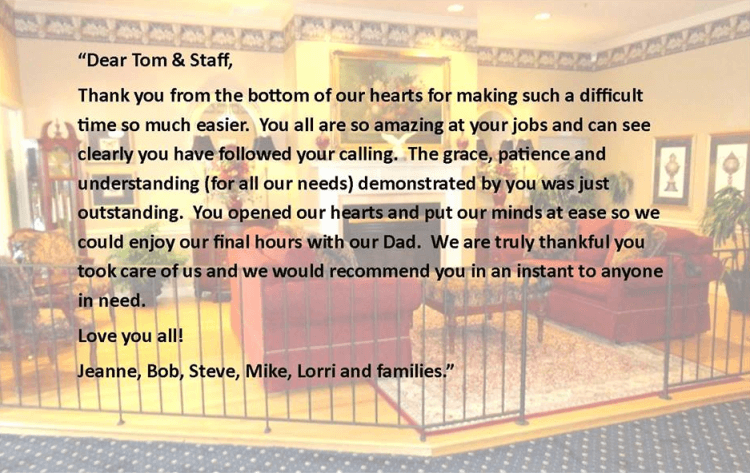 We are truly thankful you took care of us and we would recommend you in an instant to anyone in need. I and my family want to thank you, from the bottom of our hearts, for your kindness and caring through a most difficult time. 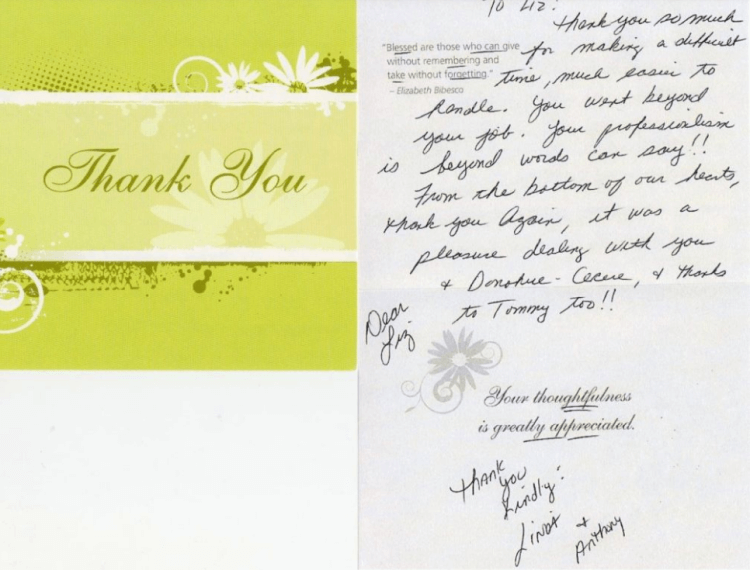 You and your staff went above and beyond to make sure all of our needs were taken care of. Even after all was said and done, you continued to be there to help when other problems arose. I also want to thank you for the cookie tray; they were delicious. You and your staff make the world a better place. 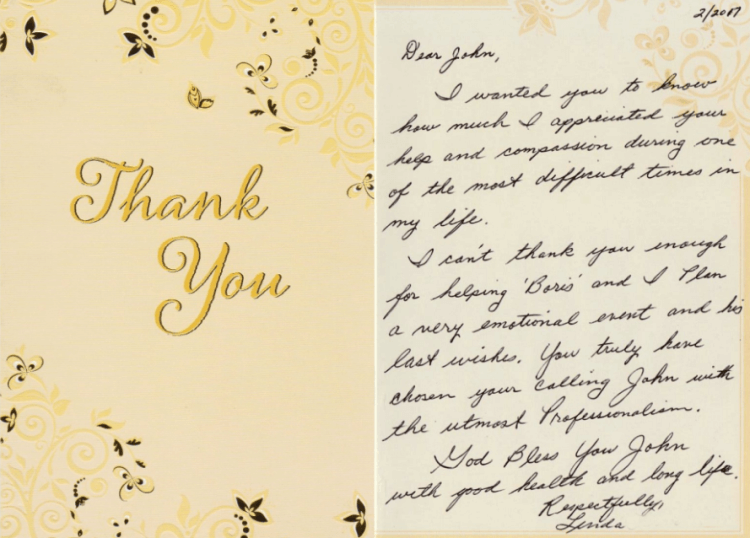 I wanted you to know how much I appreciated your help and compassion during one of the most difficult times in my life. I can’t thank you enough for helping “Boris” and I plan a very emotional event, his last wishes. 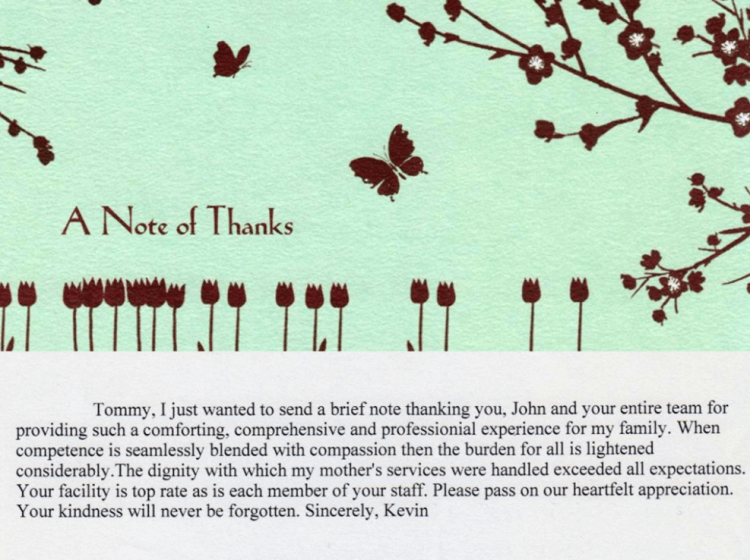 You truly have chosen your calling John with the utmost professionalism. God bless you John with good health and long life. I just wanted to send a brief note thanking you, John and your entire team for providing such a comforting, comprehensive and professional experience for my family. When competence is seamlessly blended with compassion then the burden for all is lightened considerably. The dignity with which my mother’s services were handled exceeded all expectations. Your facility is top rate, as is each member of your staff. Please pass on our heartfelt appreciation. Your kindness will never be forgotten.